Parenting is not easy. Getting clean laundry into the drier is not easy for me. Teaching Pre-Algebra and asking my son to “show the work” is not easy. Finding matching socks …. still, not easy. 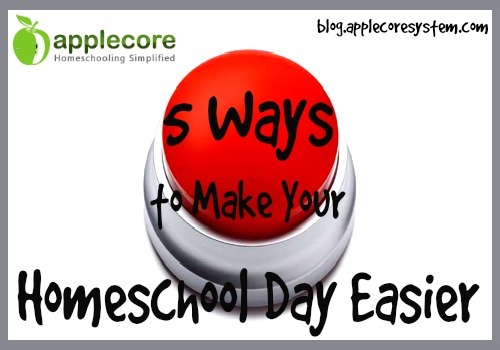 You might feel like homeschool is not easy. I wish there were a magical red button we could all hit for easy to appear. Why focus on easy – why not shoot for easier? I like the idea of being flexible and spontaneous, but really it doesn’t help when I have to teach 2nd grade math. It’s not ideal when I have promised a science experiment and have no idea what materials I need. Before you hop in bed, write down a few things you’d like to accomplish tomorrow. It doesn’t have to be exact page numbers. But give yourself some type of plan. When I didn’t plan our day we were less likely to finish projects, stay on course, or even have any consistency. 2. prep lunch during breakfast. When I have to stop a lesson because of growling stomachs, prep a meal, and clean up – it’s hard to get back into our lesson. I’m more likely to say, “let’s finish it tomorrow” then get back into school mode. I have noticed the days I made sandwiches early and tossed them into the refrigerator I felt less stressed. Those days we ended up grabbing lunch and heading right outside to enjoy a picnic. I would bring a book and we’d finish school outside. 3. everything has a home. We do our lessons at a 6 person dining room table. Wanna guess how many spots are clean enough to sit down to right now? Zero! Someone always pushes books, papers, and supplies around to the far edges until there is absolutely no room to sit down at the table. When we put books, papers, and supplies away – right away, the table is always clean and available for a new lesson. Everything has a home, so put it away sooner than later. 4. one day a week. My wonderful boys always have fun ideas … at the absolute worst times. The 2nd grader wants to draw seahorses while learning subtraction. Yet when he’s “bored” he can’t find anything to do. I started a little “idea wall” where the boys can add anything they want to try or do and one day a week they can pick a project to work on from the wall. Rather than trying to squish something into a day when we’re running around or busy – we just wait until our “one day a week” time. I noticed this idea was far better than always having to say “no”. Let your children check their own work. Show them the correct answers and let them mark their answers wrong. This was far easier on me when my 6th grade son could mark his math tests and I could help my 1st grader sound out blends. I’d quickly scan his paper but it was a great opportunity to show him I trusted him. I do believe this is also a good practice for children to start being accountable and taking responsibility. Okay, I do have a #6, but most of us are not going to like it! 6. set an earlier bedtime, mom. How can a mom feel refreshed and ahead of the game when she’s always running behind trying to catch up? When we stay up late we’re just doing ourselves a disservice. I promise all those shows are available to watch the next day on the internet. Sure, we have nights when we stay up late to finish something, go somewhere, or whatever … but I’m talking about a regular habit of getting to sleep at a decent hour in order to wake up ready for your day. I would stay up until 2am, crawl into bed, think for another hour on some great hands-on project, and then slide out of bed angry at 7am trying to smile at chipper happy children. Worse, I always forgot what I had been thinking about before I feel asleep. As much as I realize we have to put children to bed at a decent hour … I have to put me to bed at a decent hour! Not tired yet? During the day: go workout. Pull weeds. Stop drinking caffeine after lunch. Diffuse lavender. Drink something warm and relaxing. Turn the lights down. Play relaxing music. Take a bubble bath.